Objective: Malignant gliomas are primary brain tumors with excessive mortality and high resistance to chemotherapy and radiotherapy. The survival time for glioblastoma multi­forme is about 6-12 months. As key pathogenetic mechanisms are recognized the massive necrosis, angiogenesis and hypoxia within the tumor, as well as the resistance to apoptosis. It is also suspected that altered immune response might contribute to the fatal clinical outcome. The aim of the present study was to determine the immune status of patients with malignant gliomas. Material and methods: Peripheral blood lymphocytes were collected preoperatively from 9 patients (aged 57-76) diagnosed as anaplastic astrocytoma grade III (n=4) and glioblastoma multiforme (n=5). The following lymphocyte populations were analyzed by flow cytometry: CD19+, CD3+, CD3+CD4+, CD3+CD8+, CD3-CD56+, CD3+CD56+, CD3+CD25+, CD8-CD11b+, CD8+CD11b+, CD8+CD11b-. The results obtained were compared to reference values for each cell population. Results: No significant alterations were detected in CD19+, CD3+, CD3+CD4+, CD3+CD8+ cells, but the CD4/CD8 ratio was below the reference range in some cases. No obvious decrease in (CD3-CD56+) NK cells and (CD3-CD56+) NKT cells was observed in most patients. A reproducible phenomenon of increased CD8+CD11b+ and decreased CD8+CD11b- cells was noticed. These preliminary results suggest that the immune response in patients with malignant glioma is seriously disregulated. The rapid clinical deterioration, relapses and high mortality could be at least partially explained with the suppressed activity of NK-cells which are the major cytotoxic antitumoral cells. The increase in the population of activated suppressor-effector cells also contributes to the unfavourable outcome in malignant brain tumors. Conclusion: This pilot study reveals the presence of altered immune response in malignant gliomas and opens possibilities for prospective investigations concerning immune status and clinical outcome. Key words: glioma, immune response, immune suppression. Please cite this article as: Koev I, Slavov E, Staykov D, Halacheva K, Sarafian V. IMMUNE RESPONSE IN MALIGNANT GLIOMA. J of IMAB. 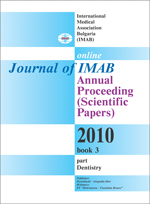 2010; 16(3):17-19. doi: 10.5272/jimab.1632010_17-19. 2. Dix AR, Brooks WH, Roszman TL et al. Immune defects observed in patients with primary malignant brain tumors. J Neuroimmunol, 1999; 100:216-232. 3. Gustafson MP, Lin Y, New KC et al. Systemic immune suppression in glio­blasto­ma: the interplay between CD14 +HLA-DRlo/neg monocytes, tumor factors, and dexamethasone. Neuro Oncol, 2010 Feb 23. 4. Chiu TL, Lin SZ, Hsieh WH et al. AAV2-mediated interleukin-12 in the treatment of malignant brain tumors through activation of NK cells. Int J Oncol, 2009; 35: 1361-1367. 7. Kempuraj D, Devi RS, Madhappan B et al. T lymphocyte subsets and immunoglobulins in intracranial tumor patients before and after treatment, and based on histological type of tumors. Int J Immunopathol Pharmacol, 2004; 17 : 57-64.